Letters From…. 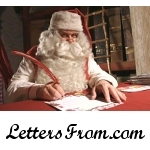 | Letters from Santa, Rudolph, Frosty and other members of the Council of Legendary Figures. Kids love going to the mailbox to get the mail. Imagine their joy to find a letter from Santa addressed to them. Whatever season it is, whatever the occasion, we offer a variety of personalized letters available to match the special day. Each letter is printed on appropriate stationery and is customized using the information that you provide during the checkout process. We offer three different kinds of letters from Santa, a letter from Rudolph, a letter from Frosty, and coming soon we will be offering a letter from the Easter Bunny, a letter from the Tooth Fairy, and more. We are always looking for suggestions as well. If there is a special occasion that you would like to send a letter for, please let us know and we will try and add letters to suit the needs of our customers.